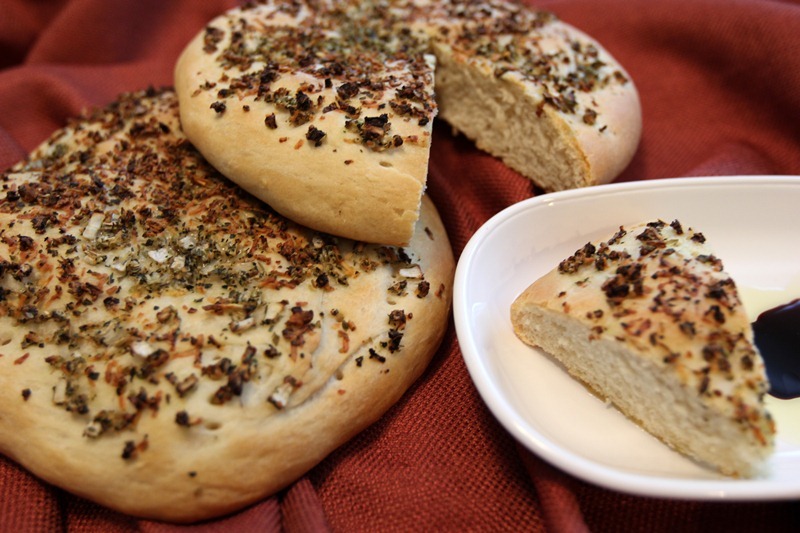 I have made the original recipe for this bread several times and it is so good. When I received my Sciabica Garlic Extra Virgin Olive Oil (which tastes and smells incredible, by the way), I knew it was the perfect thing to use in place of regular olive oil. Mix 1 cup of flour, sugar, salt and yeast in a large mixer bowl. Add 1/4 cup of the Sciabica Garlic Extra Virgin Olive Oil and the warm water. Beat on medium speed for 3 minutes, scraping bowl occasionally. Start adding in the rest of the flour, 1/2 cup at a time, just until the dough is soft and leaves the side of bowl (you may not need all of the flour). Turn dough out onto a lightly floured surface and gently roll in flour to coat. Knead 5 to 10 minutes, or until dough is smooth and elastic. If you have a stand mixer with a dough hook, you can knead it this way, too. This is what I did and I let the dough hook knead on a low speed for about 5 minutes. Now place the dough in a greased bowl and turn so the greased side is up. Cover and let rise in a warm place for 1 to 1 1/2 hours, or until the dough doubles in size (dough is ready when an indentation remains when touched). Preheat oven to 425°F. Grease two cookie sheets. Punch down the dough and divide in half. Shape each half into flattened 12 inch rounds on each cookie sheet. Cover and let rise in a warm place for 20 minutes. Prick the centers and 1 inch from the edge thoroughly with a fork. Brush with the leftover tablespoon of the Sciabica Garlic Extra Virgin Olive Oil, sprinkle each with dried Italian herbs, Parmesan cheese and onions. Bake 12 to 15 minutes, or until golden brown (mine took a little longer than this). Serve warm. Delicious if you pour some of the garlic olive oil and a little balsamic vinegar on your plate and dip the bread in it!